Web of Science: What happens to all the balloons that fly into the sky, e.g. on Iceland's national holiday on 17 June? What happens to all the balloons that fly into the sky, e.g. on Iceland's national holiday on 17 June? Water and air always seek a state with minimum energy. So heavy air moves below lighter air and the light air is then on top. Air rises to the surface of water because it is lighter than water. One could also say that the water sinks below the air. Oil floats on water because it has a lower density than water. Balloons that are light enough, for example those that are filled with a type of gas that is lighter than air, like helium, have the same tendency to rise into the air, if they are not restrained. 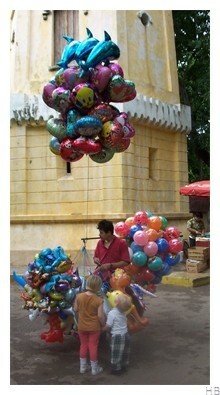 It is said that buoyancy or upward force, pulls objects like balloons up into the air. Buoyancy results from the fact that the atmosphere is in a field of gravity, where the force is in direct proportion to the mass of the atmosphere that an object displaces. Gravity exerts a pull on the air in the balloon, the balloon itself and anything that may be attached to the balloon. The greater the altitude, the lower the density of the atmosphere. If a light balloon does not change in any way, it will eventually reach a height where the buoyancy related to the air it displaces no longer exceeds the pull of gravity. The balloon stops rising. As balloons rise, air pressure around them diminishes. When the ballon is made of elastic material, it expands because of the excess pressure inside. Its volume increases and its internal pressure decreases. As it expands, its buoyancy increases, but not the pull of gravity, so it continues to rise as a result of the expansion. So, generally speaking, balloons that can expand will rise higher than those that have small expansion potential. A weightless balloon which neither expands nor shrinks will reach a height of about sixteen kilometres if it is filled with helium. If we assume that an empty balloon weighs 5 g and is 30 cm in diameter, it would only reach half that height. If this same 5 g balloon is made of material that would allow it to expand to twice its initial diameter while rising, then equilibrium between buoyancy and the pull of gravity would not be reached until a height of 18 kilometres. If the balloon weighed 15 g, it would not rise given normal June tempertaures in Iceland, about 11°C. There is a relationship between the density of air and its temperature, such that the colder the weather, the heavier the balloon has to be to stay at ground level. In other words, the colder the air, the greater the buoyancy. With air temperature at 250C, the balloon and anything attached to it only needs to weigh a little over 14 g to remain at ground level. But someone celebrating the 17th June at the South Pole at 400C below would need a balloon weighing at least 18 g if it wasn't to disappear into the clouds. The standard helium balloons that are sold on the 17th June do not expand a great deal. So when the balloon rises one can assume that a significant pressure difference will develop between the air inside and the surrounding air. Such balloons are not strong, so they can be expected to succumb quickly to the pressure and leak or burst and fall to the earth. Strong balloons made of elastic material that can expand considerably, will reach much greater heights than those sold on the National Day. Strong balloons are used daily to carry weather sensors up to heights of 20-30 kilometres before bursting. Winds in the upper atmosphere can then carry the sensor equipment and remains of the balloon tens of kilometers from where they were originally released before they reach the ground again. Most helium balloons will eventually burst and fall to earth, but their weight and the material they are made of determines the height they will reach. Tests have been made to find out how high various types of balloon will rise before they burst, or reach equilibrium and remain at a certain altitude. The results showed that the ballons used in the tests could withstand conditions at heights ranging from 400 m to just under 11 kilometers. The material the balloons were made of was the deciding factor in how high they could reach. Hrafn Guðmundsson and Haraldur Ólafsson veðurfræðingur. „What happens to all the balloons that fly into the sky, e.g. on Iceland's national holiday on 17 June?“. The Icelandic Web of Science 29.12.2005. http://why.is/svar.php?id=5521. (Skoðað 21.4.2019).